It was kind of like two blog posts unexpectedly colliding or passing in the night past a burning barge. On Sunday, Bryan Alexander asked some large questions about How would you design a professional association for the future?. I also wrote about the impending death of Storify and in their dying process leaving no plan for preservation of the content users placed there. Public and private channels are running with shock and WTF. 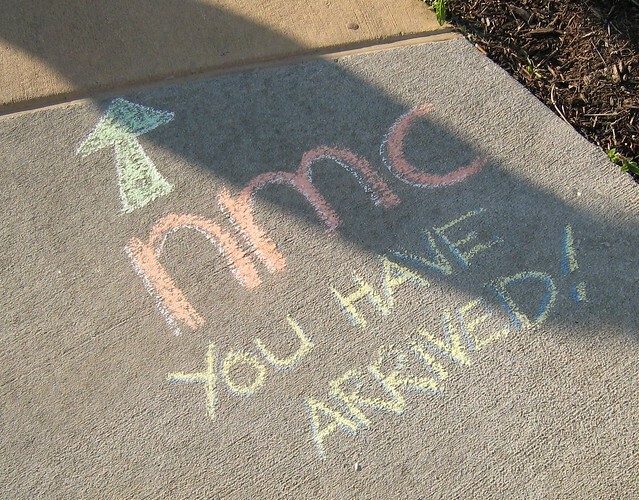 I had to laugh when I got emails and DMs asking if I know what was going on; I left NMC in 2011. I got bupkis (look Clark, I spelled it correctly). Let me be totally clear. Although I left NMC in 2011 under less than ideal conditions, the reason was a yearn for an adventure afforded by an unexpected inheritance. I’ve hardly looked back only because I was looking ahead. 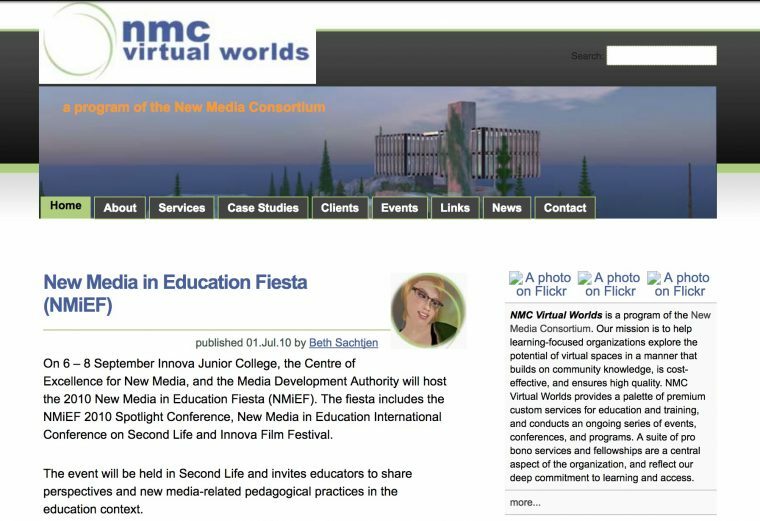 None of what I’ve done since then would have been possible without the experience and connections I got in five years at NMC. Those years were a career accelerator and I am still riding on that momentum. Advice is going out now to not be concocting stories and speculations about what is going on. That sounds nice but totally disregards the human nature to understand. We humans are story powered creatures, and if not provided information about something important to us, we will naturally create our own tales. Try stopping human curiosity. And whatever happened, it’s now being sorted out in very small circles, probably surrounded by lawyers. The way in which this was cryptically communicated, out of the blue, in the middle of the production of the Horizon Report, shortly before Christmas, signifies it is seismic or atomic bomb intensity. It will be told sometime. Oh well. 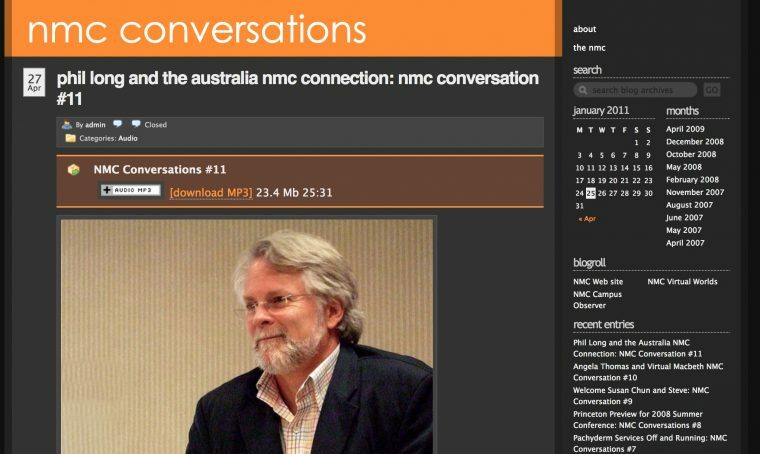 There is also the question of NMC web content. The announcement’s language suggests the site will go away, at least in its current, accessible form. That’s a lot of material. 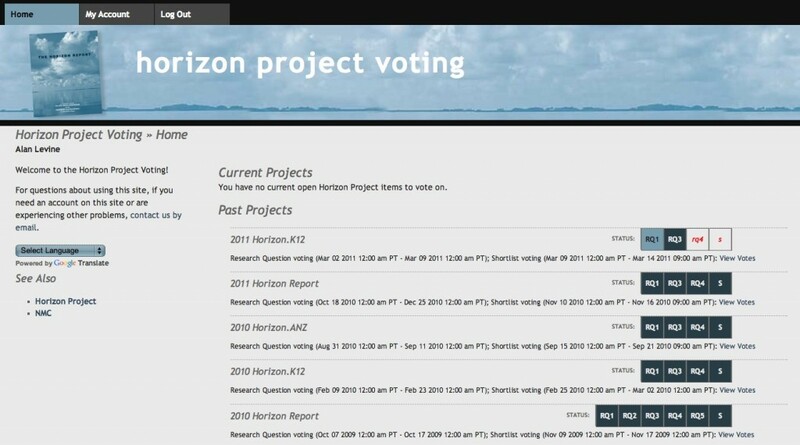 It’s more than the Horizon Reports, the web site is a huge legacy, and what if the legal outcome is shutting it down? I’ve got some expansions on my comment to Bryan’s post. Google removed the search parameter to see how many web pages link to NMC, but I’d say its in the 10s to 100s of thousands. All of which potentially might end up in the giant pile of dead links. I cited one of the best examples I know of an organization, IT COnversations, that was winding down and thoughtfully managed their web history with an eye for the future. 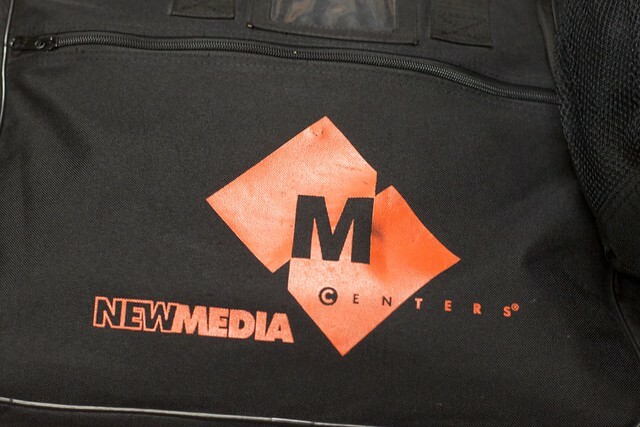 Moving all NMC content to the Internet Archive would be a worthy thing to happen (though likely not possible after this story weaves through the courtroom), it’s still problematic for all of these busted links. My hunch is less than a single digit of the internet knows after seeing a “site not found” message how to seek out the copy in the Wayback Machine. It’s valuable, but not perfect. Not an archive. 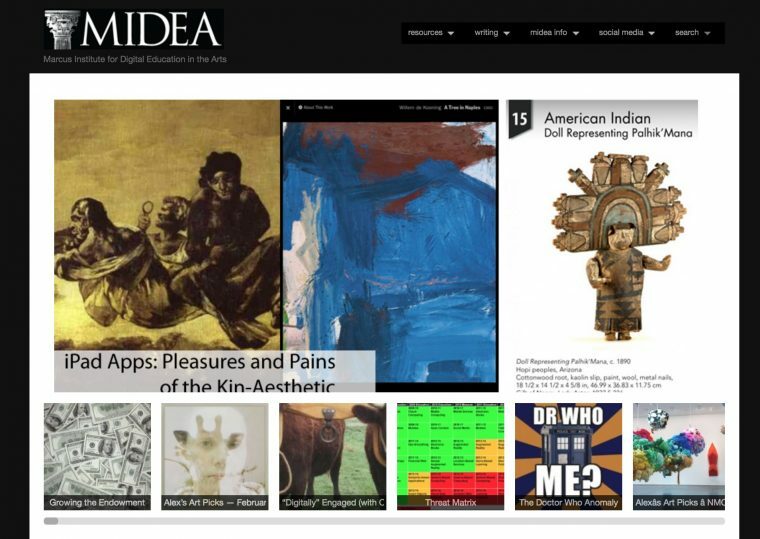 Archives are really really really important but most organizations, companies, and individuals don’t think about history or the idea that what they publish on the web is part of an interconnected fabric. As stuff was updated each year for the conference they just overwrite the previous year’s content. It took about a year, working with ideas from membership and getting a lot of contracted help, because, believe it or not, I chose drupal as the platform. Seriously. Because of the transaction stuff and the membership stuff. How do I know this? Heck, I blogged it. 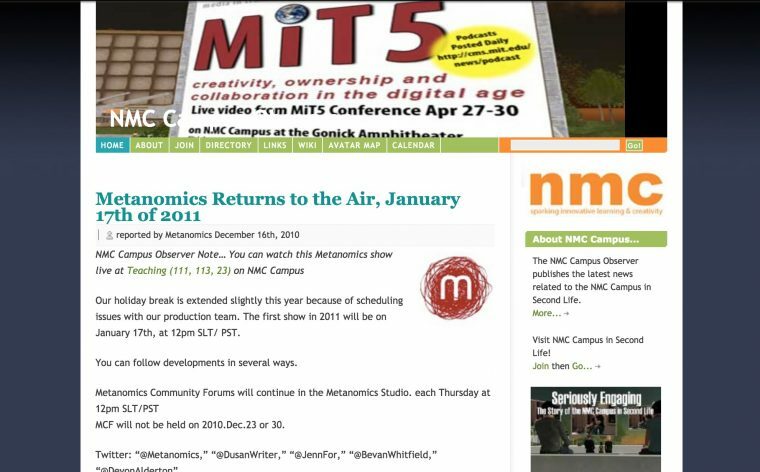 But even at the time, I preserved the previous site at archive.nmc.org (no longer active). I did a lot more research at the time I was building sites, poking around the NMC file server, finding remnants of even earlier versions of the web site, and the very founding of the organization at some media meeting in Japan, and posting them online (sorry I am running out of energy to find them) (you won’t find them on the current site). Keeping the legacy and providing as much of the work we did on the web was a driving force for me, always has been. The organization put a lot of effort in PDF versions of papers and reports, on my own I manually converted them to web content. You cannot link to page 7 of the PDF of the 2010 Horizon report. You cannot comment on it. It’s one single [pretty] content blob. 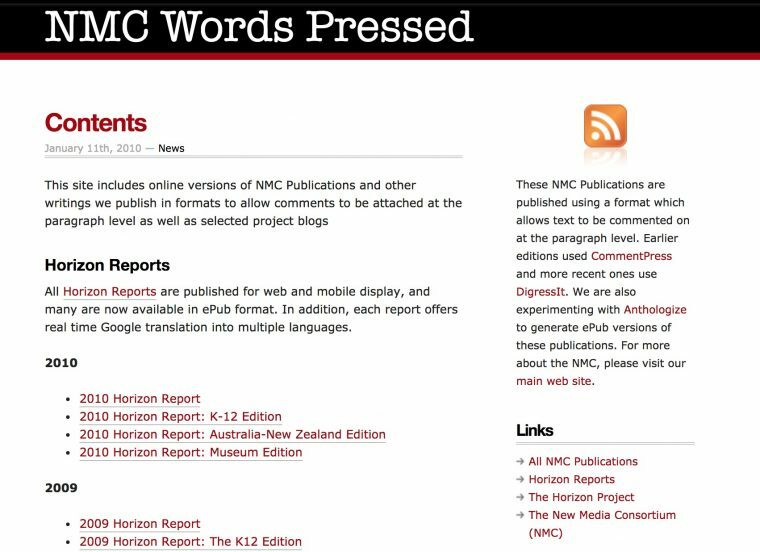 I tried to change that in my first WordPress Multisite project– http://wp.nmc.org/, where I put several years of Horizon Reports and other papers online, in a linkable format, and where, using early versions of CommentPress, people could comment on publications at the paragraph level. This too is totally gone, except for the Internet Archive’s versions. 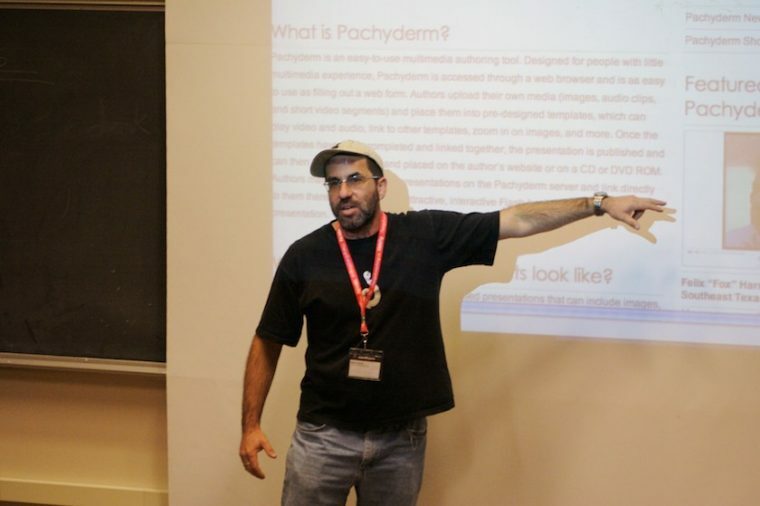 This post was rather pivotal for my career… shortly after I was at the 2008 Northern Voice Conference and offered this WordPress makeover as a presentation in the Unconference Day (I miss Moose Camp, that was all you Scott Leslie). I’m leaving out all of the Horizon and other project wikis I set up, these are working because they are hosted on WikiSpaces. No one kept up the indices, but they used it up to this year that’s all my design work there (actually I got a big lift on that from Jo Kay more known for her Virtual Worlds work who refused to accept payment or credit). 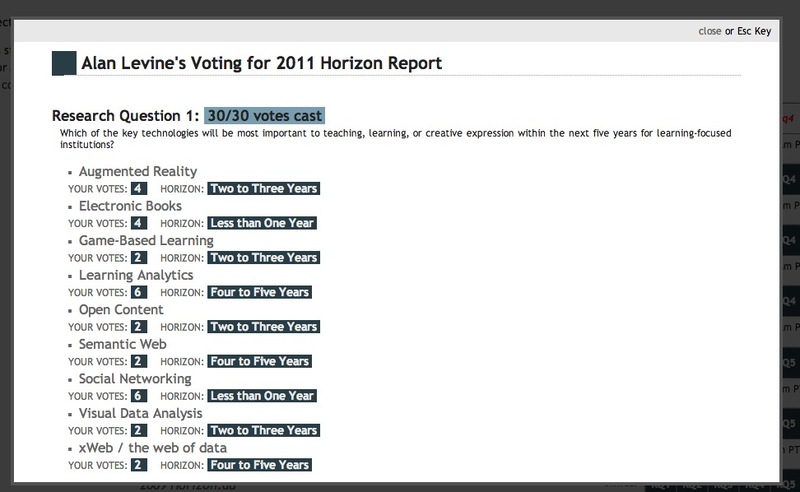 At it looks like NMC was still using the hand coded web-based voting tool I built myself http://horizon.nmc.org/voting-tool/. Before I got to NMC the way the voting was done was by emailing a Word doc to Horizon Board members, who edited it, sent it back to the CEO, who than hand entered votes in a spreadsheet. It provided each participant record of their votes, and at an admin level it summarized the status and summary voting. And it archived data year to year. It might be the most useful thing I built. It’s all PHP and mySQL hand coded. 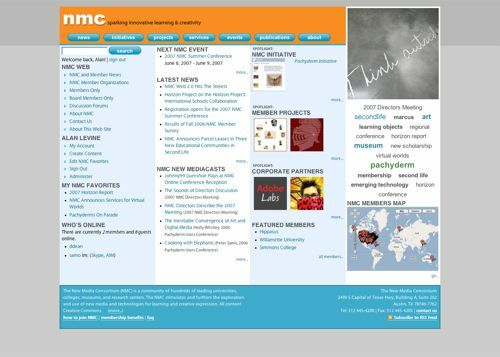 When I left NMC I saved a lot, but I did not export the WordPress site data, I saw no need for me to have it. I have a hard drive full of other flotsam and websum. I did make a mistake of putting a lot of video on blip.tv (which bit the dust a long time ago) but I do have most of the original video on that hard drive. 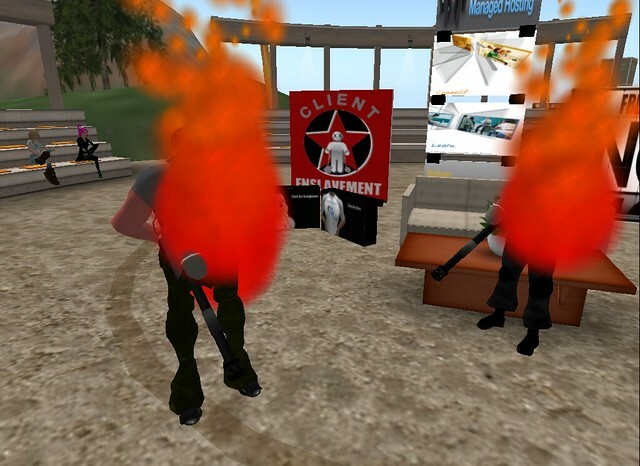 Last year I dug in and restored a necessary classic, the Second Life presentation where Jim Groom and Tom Woodward shooting flamethrowers at LMS zombies. I imagine when some new IT person comes on an looks on the pile of **** I left, it’s easier to cut and build. Who wants to manage a bunch of old WordPress sites… except that it’s rather easy to convert WordPress sites to static HTML. And it’s happened before. 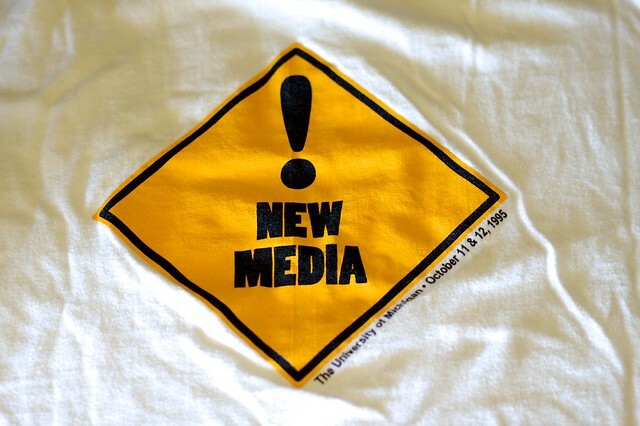 When I left the Maricopa Community Colleges in 2006 (to work for NMC), sometime later they took a flamethrower to every shred of web content I created between 1993 and 2006… There was a good cause as a lot of my mid 1990 vintage sites were based on perl scripts writing to openly editable text files, a security nightmare. But rather than try to assess, close problems like that, the most typical IT solution is a total bulldozering of web content. Who gives a f*** about old web sites? What we really need are like a million more librarians out there helping IT people appreciate the importance of careful archiving. What we need are more people to gather, share, and care about organizing, curating, preserving our own stuff, and the stuff of organizations we work for. The orgs are likely not going to do this work; it’s up to the individual. Who is game? This blog post was meant to be a bit shorter. Sort of. I could probably dig up more NMC paraphernalia all night long. But what for? 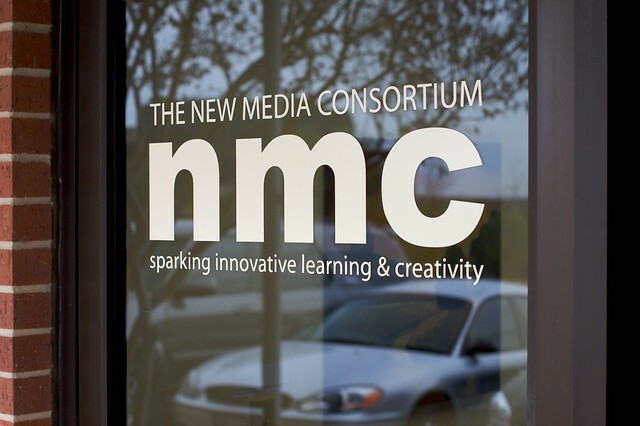 My bets are the nmc.org content, which is a fraction of its real history, will be bulldozed. At least we have shreds in the Internet Archive and the memories of some nostalgic people. I may be a better archivist than I thought; I just opened my hard drive of NMC archive materials and found more than I expected. 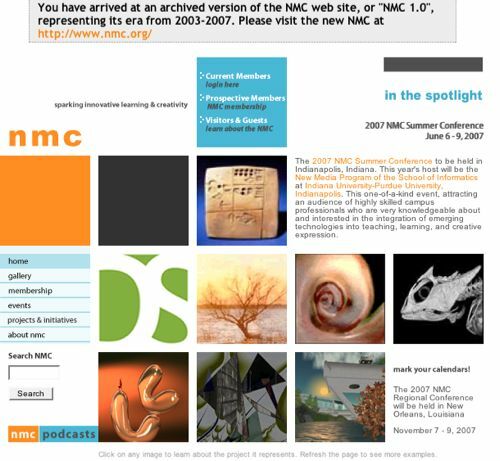 First, I remembered the archive site I did of an earlier version of the NMC web site as greensite.nmc.org no longer available (partly on the Internet Archive, images missing) … it’s all there. Also there were all wordpress sites, a few more I forgot about. 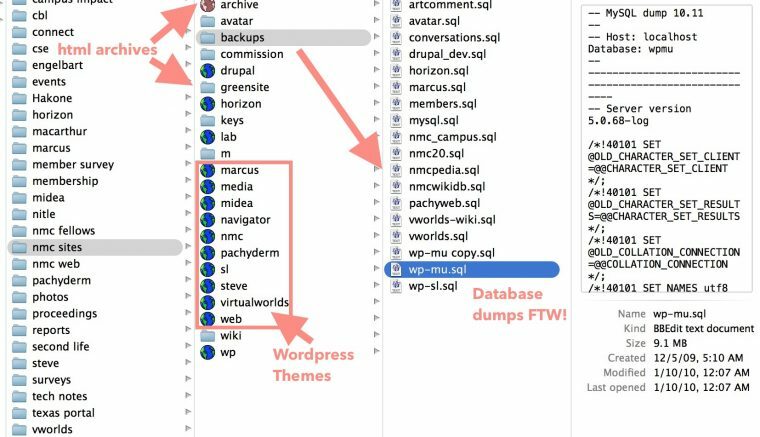 And… drumroll… I did do MySQL dumps for the wordpress sites, woo hoo! My NMC web archive is better than I thought. 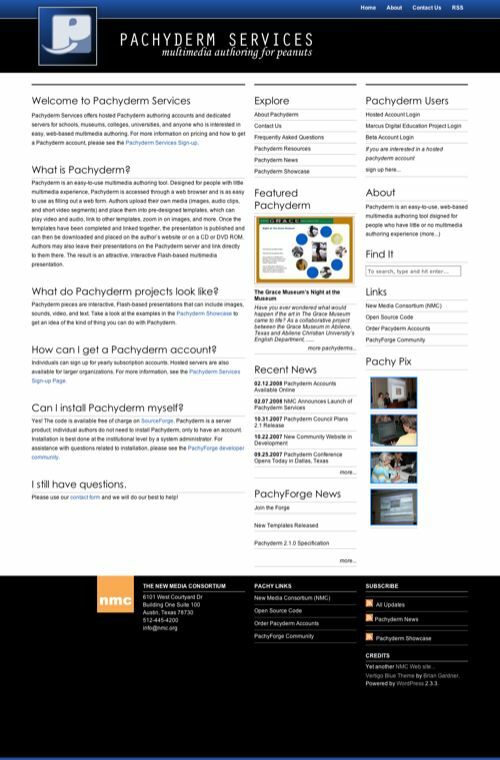 In theory, someone could re-establish these WordPress sites, than do Site Sucking process to convert to static HTML. What a post, dog: so thoughtful, so sad, so full of memory and your fierce creativity. We treat the web like an Etch-a-Sketch far too often. Thank Cthulhu for the Internet Archive and folks like yourself. Yes! More archiving, this time from the great CogDog! 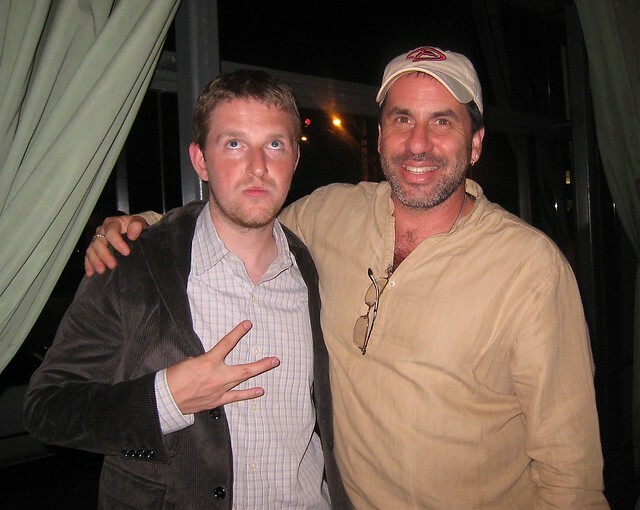 To me Alan Levine was NMC – and I know there we great people in your company (company as in colleagues) as well. The memories of these days continues to inform me and obviously others in this EdTech space. You continue this great work in post after post. And I will always fondly remember the UMW days where we both worked on a special video project and got a chance to ride the historic roads of Fredericksburg. 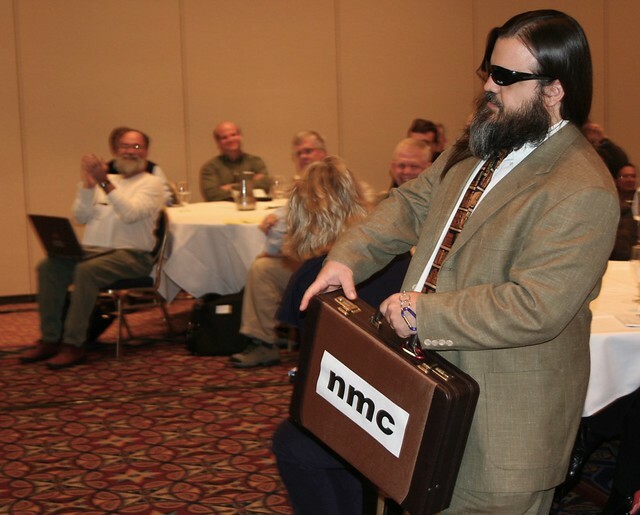 Cheers to your historical account of NMC and to your continued high level of creativity. I and my community appreciate it! Thanks Andy, and I carry many of those same memories.